The Mountain Bike scene in India is promising, but currently it is not how it should be. India is a land with all types of terrains and riding opportunities for different riders, but sadly it has not excelled in the field of mountain biking as much as it should have been. The major bicycle manufacturers in India, are not keen on introducing 'properly equipped' mountain bikes for the Indian market. Thus the scene is not pretty at the moment. The general mindset among the Indian people is that, once you graduated from, it is below one's dignity to ride a bicycle. Consequently a person wants to get an motorized vehicle to show rich he is. In some parts of India, riding a bicycle shows how poor a person is, as he cannot afford a motorized vehicle. Such mentality has to be changed. The people have to be made aware that riding a bicycle is not a thing what poor people do, but the pleasure that you get out of it that matters.What we at XS : Mtb Club are trying to do is to promote the sport, here in India, so that more people would know that a sport such as mountain biking exists in India, and can be done with ease. Bike Shops here only sell Indian-made bicycles. A few shops in the country stock imported brands, and that too are road bikes for road riding is much more popular here. The mountain bikes are the type of bikes that existed in USA or Europe in the early 90's. They are equipped with old Shimano Tourney-type gears with index-friction shifting levers. The suspensions are locally made with simple spring mechanism. A few good bikes have recently come out in the market, which offers full-suspension system. The concept of an aluminum mountain bike is still unknown here. XS-Mtb Club is located in the city of Pune in the province of Maharashtra which is 150 km from Bombay. Pune is nestled in a valley and is surrounded by a hills and mountains. The terrain is part of the Sahyadri Mountain Range. There are amazing trails in Pune, which offer you everything from long XC rides to hair-raising descents. The whole province of Maharashtra has great places for all types of riders. But, North India is the place to ride, if you are planning to come to India on a mountain bike trip. One can ride in the Himalayan Range as well as places like 'Leh', 'Ladakh' and 'Himachal Pradesh' There are great trails which are considered to be some of the best in the world. 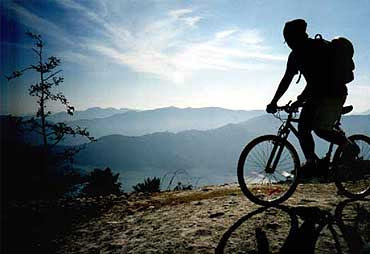 Extreme Sports: Mountain Bike club is the only organization in India dedicated to promoting the sport of mountain biking. We have been riding from the past 8 years now and have enough expertise and experience to conduct mountain bike races and tours which we think are the best ways to promote mountain biking in India. What we need is international support from American / European or other developed Asian countries to promote the sport of mountain biking in India. There is a huge market for mountain bikes in India, and once the sport catches on, there will be no looking back.